Sometimes rumors sound too good to be true, and when that happens we usually decide internally to leave such talk off UTG until more information is made available. This is one of those times. Early today, Hits Daily Double caused a bit of an alternative scene panic when an update to their January album release calendar appeared to reveal plans for a new My Chemical Romance release. 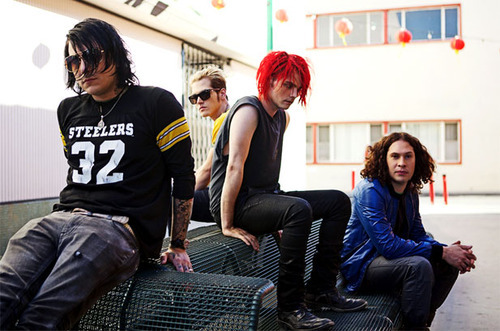 Blogs began covering the story, Twitter exploded with chatter, and before I had finished my second cup of coffee it seemed everyone was already believing MCR had returned from the grave. Well, sorry to break your recently patched together hearts once more, but My Chemical Romance are still on hiatus. As vocalist Gerard Way revealed in a tweet to a fan who inquired about the rumors, the band will be releasing their first Greatest Hits compilation through Warner Bros in January 2014. Way is currently designing the artwork for the project, but no further information is available at this time. You can see his original tweet below.